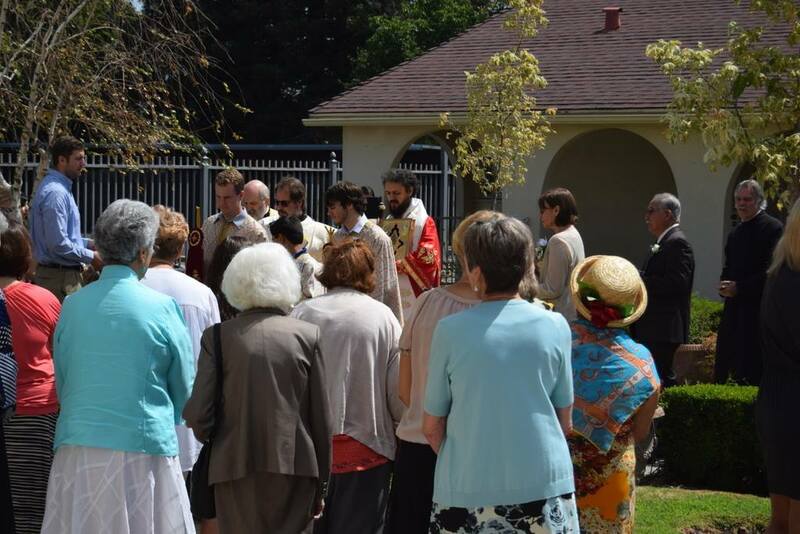 Fresno, CA - On the occasion of the Feast Day of the Holy Apostles Peter and Paul, His Grace Bishop Maxim visited the faithful of the Saint Peter Serbian Orthodox Church in Fresno, California to lead this congregation on this Feast day for a Hierarchical Divine Liturgy and Parish Slava celebration. Assisting His Grace for this Archpastoral visit were Protodeacon Brad Matthews and Deacon Dragan Stojanovich. Upon arriving at the Church Vladika was welcomed by the Deacons, Reader, and Acolytes at with all of the parishioners filling this temple and the singing was sublime. Similarly, the beauty of this temple, erected in 1957, and the preservation of it was evident. Noticeably missing was the rector Very Reverend George Gligich who could not attend due to a medical situation. After the Gospel reading, Bishop Maxim spoke about how the Apostle Peter’s words were a divine revelation from God, when Jesus asked his disciples “Who do men say that I, the Son of Man am?.” Simon Peter answered and said “You are Christ, the Son of the Living God” (Matthew 16:13-19). This Divine Revelation can only be given to us by God and not by human reason. Bishop Maxims said that Christ Himself asks His disciples an ontological question: “Who do men say that I am” (τίνα με λέγουσιν οἱ ἄνθρωποι εἶναι)? From the Apostles’ response, we see that the Person of Jesus Christ seems to have generated an important question about His identity among His contemporaries: Who is He? However, despite the potential “contextual” responses (e.g., a prophet, John the Baptist, etc., all of which imply a moral teacher), the Apostle Peter’s response does not come based on context (“For flesh and blood has not revealed this to you”), but comes “from above” (“but my Father who is in heaven,” Mt. 16:17). Christ is the Son of the Living God, able to destroy death and judge the world, and therefore He is the Savior of the world. Thus the preaching of the Resurrection is the nucleus of every dogma. As the Eucharistic moment approached, the choir sang beautifully and the Bishop administered the Holy Eucharist to the faithful thus fulfilling our greatest joy of the day. Before leaving the temple the Slavski Kolach and Wheat was blessed by the Vladika and the congregants “turned” the Kolach while those who could not turn the kolach were touching other’s shoulder ahead of them so that a physical contact with the Holy Bread connected all in unison, as the choir sang the hymn “O Holy Martyrs”. Finally, everyone moved to the social hall for the feast prepared by the hard working parishioners and for the program to follow. The Kum and Kuma for the Slava, Michael and Annabelle Castro, offered their thanks to His Grace and to all in attendance. Father Jim Pappas from the local Greek Orthodox Church and his family came to attended the social gathering. May Christ the Son of the Living God continue to bless this parish in Fresno and grant health and many years to beloved father George!